What to do as an independent dance artist in New York, a city that is in many ways increasingly hostile to art-making? The answer, for some: Move to Berlin. Built around acts of crumbling, disintegration and dispersal, “Another One” is not exactly serene. But it does feel like the product of a more relaxed environment, a project that has had time to breathe, roam around, get comfortable in its own skin. Even as Ms. Rosenblit assumes various guises and, quite literally, tears her world to pieces, she cultivates a grounded energy, adapting to havoc of her own invention. 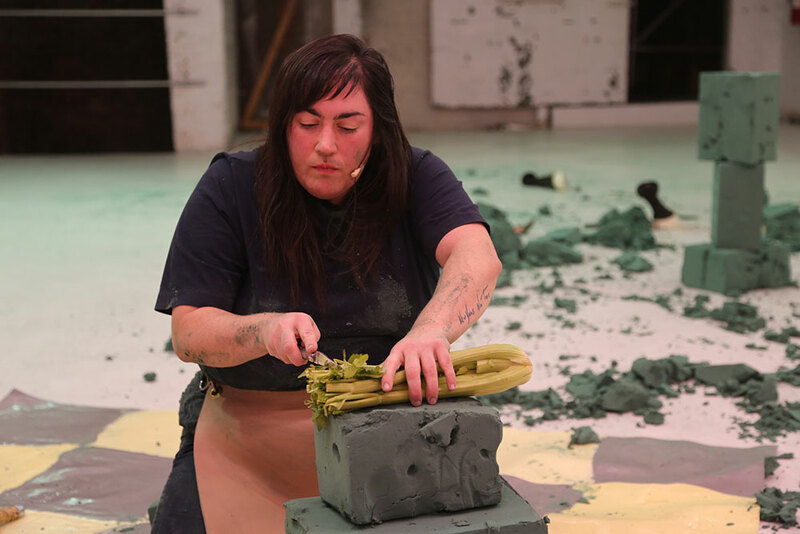 As we enter the theater, she is already ensconced in work, arranging a set of foam blocks on the floor, sliding and stacking them. Leaving trails of green dust, these prove easily crushable with the impact of a heeled shoe or even bare hands, though Ms. Rosenblit also applies heftier tools — a stockinged horse hoof that she wears for a time, a gleaming pocketknife — to the intermittent task of demolishing them. Who is “you”? Seated in profile, Ms. Rosenblit doesn’t address audience members directly at first, except for a few comically furtive glances. Yet almost imperceptibly, she turns what feels like her own intensely private space into a shared one, as if opening the door to her home, or whatever it is that she’s creating and dismantling at the same time. The invitation is cautious. “You are a pack of wolves,” she asserts, now facing us head on. Even while continuing to shred and chop — taking the pocketknife to a straw broom head and a stalk of celery — she treats the place as if it’s not to be disturbed, wiping her feet before stepping onto a checkered mat, incrementally shifting a stack of blocks. A series of gently sculptural poses, corresponding to whispered letters of the alphabet, unfurls with the same attention and care.